European scientists have proposed a mission consisting of 50 tiny spacecraft, which could visit and study over 300 asteroids in a timespan of just over three years. The concept, named Asteroid Touring Nanosat Fleet, was presented at the European Planetary Science Congress (EPSC) 2017 that took place in September in Riga, Latvia. 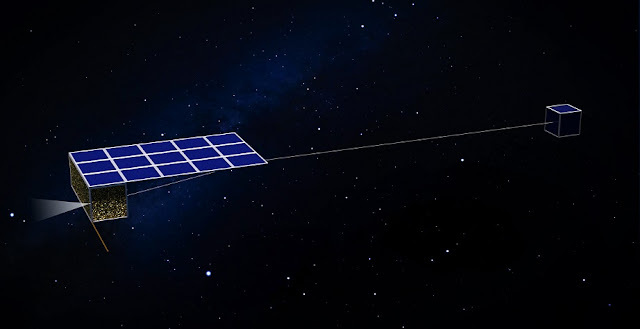 The project envisions a swarm of nanosatellites propelled by innovative electric solar wind sails (known as E-sails) taking images and studying the composition of asteroids. The tiny spacecraft would perform flybys of their targets at a range of around 620 miles (1,000 kilometers). Each nanosatellite would visit six or seven space rocks before returning to Earth. According to the mission concept, the nanosats would be equipped in 1.57-inch (4-centimeter) telescope capable of imaging the surface of asteroids with a resolution of 330 feet (100 meters) or better. Besides the optical instrument, each spacecraft would carry a spectrometer analyzing spectral signatures in light reflected or emitted by asteroids to determine their mineralogy. Both instruments combined could deliver a lot of important information about rocky space objects, including their size, shape, composition, collision history and presence of potential moons. “Since the number of targets is large, the mission is bound to produce a large number of outcomes. We still do not know so much about the small bodies of our solar system, because the number of bodies is large and only small number of them has thus far been studied at close range,” Pekka Janhunen of the Finnish Meteorological Institute, Principal Investigator of the Asteroid Touring Nanosat Fleet, told Astrowatch.net. The proposed fleet of nanosatellites could provide crucial data for future lander and sample return missions to asteroids. It could also find promising candidates for asteroid mining as it would study mineral composition and the abundance of hydrated surface minerals among different asteroid families. “They would gather data on the chemical composition of surface features, such as whether the spectral signature of water is present,” Janhunen said. He noted that the mission could improve our knowledge about asteroids significantly, given that such fleet of tiny spacecraft would study at close range more than an order of magnitude larger set of small bodies than all previous missions combined. Moreover, the mission managers hope that all these scientific goals could be achieved at very affordable price as the total cost of the project is estimated to be about 60 million euros ($70 million), what gives 200,000 euros ($233,000) per one asteroid. The Asteroid Touring Nanosat Fleet project is a response to European Space Agency’s (ESA's) “Call for new science ideas” and was lately selected by the agency for further study. So far, the project is in its initial design phase and Janhunen’s team plans to submit a paper soon outlining some technical aspects of the mission in more detail. The first prototype of a nanosatellite could be launched into space within seven years from now. “If given ‘unlimited’ funding, prototype satellite could fly in five to seven years. This prototype satellite would demonstrate E-sailing in solar wind and would travel to make, for example, a flyby of a near-Earth object. After such demo mission we would be ready to design the full-scale fleet mission with perhaps another five years delay before launch,” Janhunen concluded.